Keep your crew updated throughout your production. You should keep your team up to date at all times to keep your project running smoothly. For example, if the schedule changes, reach out immediately to keep them in the loop. This will help avoid delays and roadblocks down the line. If it's an urgent message, emailing everyone in your Contacts is an effective way of going about it. 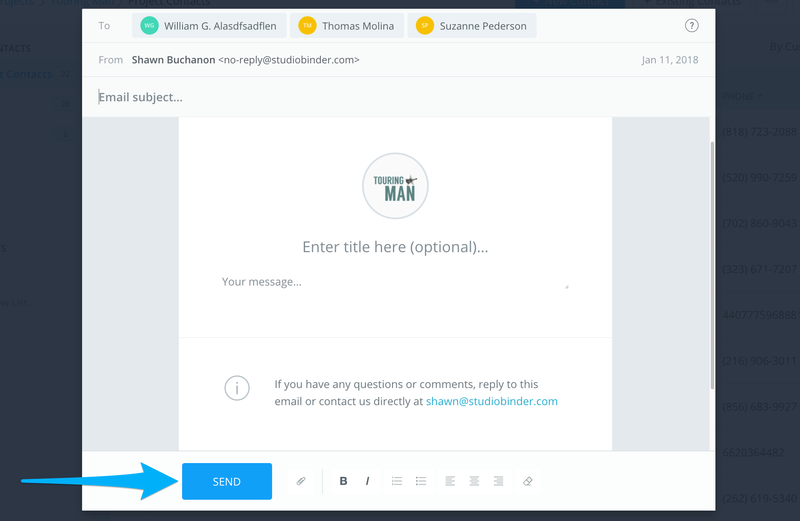 Messaging your contacts within StudioBinder is quick, convenient and saves you the hassle of jumping out of StudioBinder to access your email! On the Projects Contacts page, select your contacts. Click message to open the email box. Compose your message, and click Send! You can bold or italicize text, set paragraph and list parameters. You can also include file attachments making sure all important documents are distributed like maps, parking information, production changes, and memos. Our software even includes your project logo as part of your email providing a professional look. Can they respond to my messages? We include the senders email in the message to make it easy for your cast and crew to reach out to you! Is there a way for me to send a text (SMS) to crew? Currently, you can only deliver an email message. It's essential to let your cast and crew know of any new changes to the production. Include any pertinent documents like location maps as an attachment in your messages. This is key when it comes to any production. It will help keep confusion to a minimum, allowing you to concentrate on your project. You can even reorder your contacts by email, name, etc.